What's Phase IV? Phase IV isn't even in the film, beginning as the film ends. The plot of the film, as onscreen captions inform us, encompasses Phase II and Phase III; Phase I is a prologue, a voice over telling us how we get to where the film's action begins. 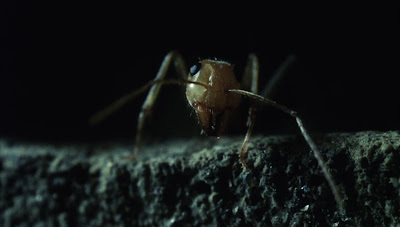 Over beautifully filmed visuals of stellar phenomena and insect life, protagonist James Lesko (Michael Murphy) explains that a cosmic event of indeterminate origin occurs, and while people were sure that it has done something, no one sees anything out of the ordinary until a scientist in the UK named Ernest Hubbs notices that the ants are organising. Banding together instead of competing. Targeting predators. Getting smart. So he calls Lesko, a cryptographer, and they head out to the desert to see what the ants are up to. Hubbs voice-overs a memorandum describing what wthat the plan is: they're going to Arizona to experiment on ways to stop it. Cue Phase II. 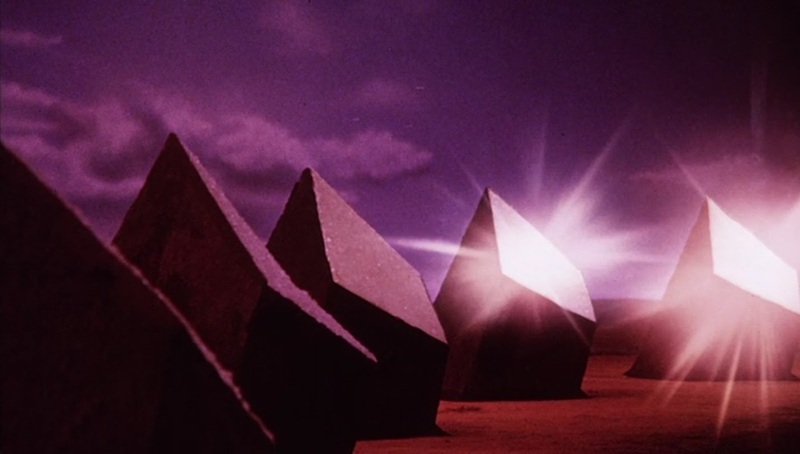 And now the body of the film then, Phases II and III, is about how we get to Phase IV. 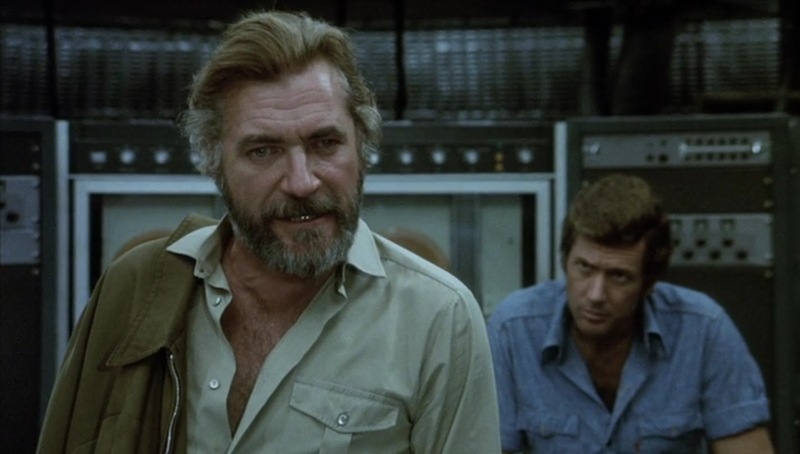 And when you name a film Phase IV, and the only caption you have at the start is Phase I, that's a signifier that the film is about its destination, that whatever comes at the end is significant. When Phase I is just a brief prologue, moving from the vast and cosmic to the tiny, and making the tiny huge, and we don't see anyone until the start of Phase II, only a few minutes in, we know we are cutting directly to the chase, that we are starting in medias res. So here are Lesko and older, authoritative Hubbs (Nigel Davenport), arriving in an area of the Arizona desert where the ants have been behaving particularly strangely. 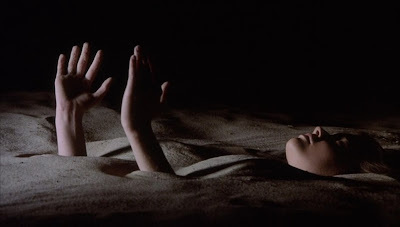 And right from the beginning, Phase IV demonstrates its commitment to strangeness: the simple geometric figures the ants have created, perfectly uniform square anthills, are really unsettling, proving that if you know what you're doing, even a simple image can be really powerful, and you don't blame Hubbs for blowing them up with a grenade launcher, even though we know Lesko is right, and it's probably a bad idea. If Phase IV hadn't have been a flop, if it hadn't had been adulterated by our old enemy Studio Interference, would Bass have had a long and distinguished career as a director? I don't know. There's a lot about Phase IV that, superficially, feels formulaic: so Lesko and Hubbs set up in a geodesic dome full of Science Stuff, and that means that we get plenty of scenes where the tense looking scientists stare nervously at waveforms on screens and dot matrix printouts (at this point I couldn't help thinking of The Andromeda Strain (1971), where much of the same happens). The whole sequence where they go and meet the one holdout family remaining, the Eldridges, seems part of the usual score too: the Eldridges tell their story, Hubbs and Lesko advise them to clear out and Mr Eldridges (Alan Gifford) says nope, he's taken measures, and so on. And we know how it's going to end up for the Stubborn Holdout Family, straight away. But again, Bass is really good at making these otherwise familiar elements really freaking odd, even weirdly poetic, and you can sort of see why this film flopped so hard, since everything about Phase IV pushes hard against the usual tropes of the scientists vs. alien nature genre. This isn't an exploitation film, it's not a low rent potboiler. 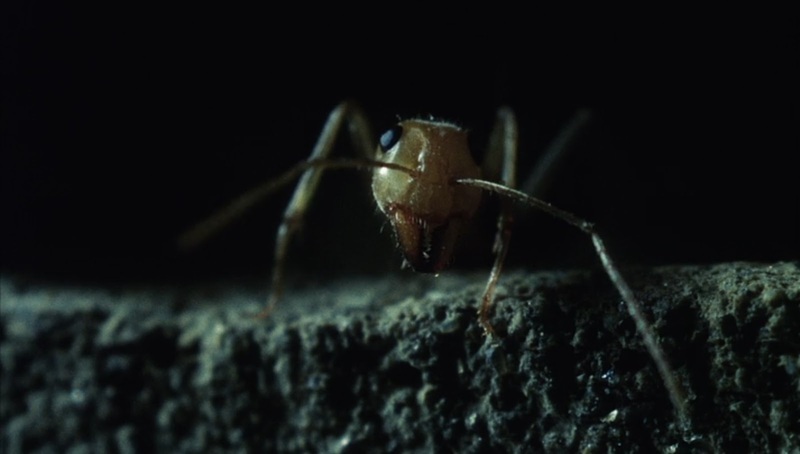 It's a film where scientists fight ants done with an artist's eye. And it's both really fabulous and exactly the sort of a film that might leave someone expecting a more conventional horror film feeling really cheated (in the way that two women I spoke with, both big horror fans, who after seeing The Witch in the cinema, both told me it was one of the worst films they had ever seen). But anyway, the Lone Holdout Family are doomed and sure enough, building a moat is not going to stop ants who are smart enough to use rafts, and there's a chaotic attack, a dead horse, a collapsing farmhouse and a terrified escape. Somehow the Eldridges make it to the dome, but only, by the cruelest of plot contrivances, at the exact moment that Hubbs switches on the high density insecticide and poisons the vicinity, killing all of the Eldridges apart from their daughter Kendra (Lynne Frederick, not entirely convincingly affecting an American accent), who survives by hiding under the tarp at the back of the van. And that is brutal. In a film with literally six human actors (and a buttload of ants), the humans have already beaten the bodycount claimed by, you know, the alien enemy. And worse still is that while Lesko is horrified when they find out what's happened, Hubbs doesn't seem to be bothered at all, and just wants to do some science, and suddenly he's nearly as unsettling as the ants are. The ensuing siege is an exercise in increasing tension. The three humans become trapped by a fiendish, alien intellect and with Kendra traumatised, and Hubbs feverish from an infected ant bite, Lesko realises – and we're well into Phase III here – that they're not the ones doing the experiments. And suddenly everything makes sense. In movies like this, Insect Conquest Movies, I mean, the big flaw is that the bugs should really be invincible. They can get in any time they want. They can strip mammalian flesh in seconds. They can breed insecticide-proof soldier ants given a couple hours. They're smart enough to build solar reflectors, turning the dome into an oven. Why don't they just kill the humans? Insects are the most successful animal life on this planet. And the big plot hole in any film where the bugs are staging a murderous takeover is that if the bugs ever did get the will and the smarts to organise and kill us humans, the human race would be annihilated in a matter of days, tops. Phase IV approaches this problem by suggesting that perhaps something stranger might happen. And certainly, by the end of the film, the ants have demonstrated that they can get in and do whatever they want. So what are they up to? What do they want? And here's where this film falls into my project. Because what the ants want is us. They want us to be part of their world. In the original version of the film, the realisation of this leads the surviving humans into a transformation experience, and a six-minute 2001-style psychedelic freak out, full of wonder and horror, where we see glimpses of the future of what would probably be homo formica, except no one will be doing science and giving things Latin names anymore, and we see glimpses of people living in hives and hatching from eggs and sharing the hive mind, but also experiencing the interconnectedness of nature: flying like birds, being part of the greater conssciousness of nature. Being a part of nature in a way that we're not, for better or for worse. In the film we got – and this is the version on DVD, Blu Ray and Netflix – we get maybe a minute and a half of that, and it's over with a brief voice over from Lesko, and it's OK, but it's just sudden, really, or it is if you weren't paying attention, except OK, it is pretty sudden, and you see why Saul Bass was pissed off, because the original version of that final montage (go find it on YouTube) is amazing stuff. 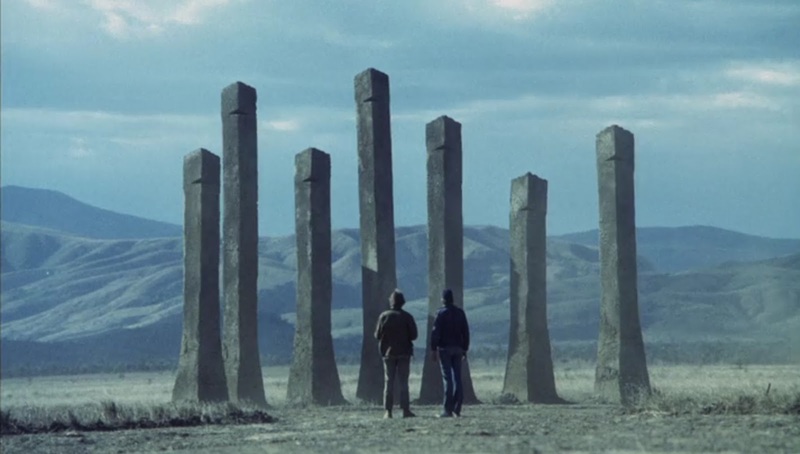 The original intent of Phase IV, then, was to posit what it would mean for the human race to lose its mastery of the earth, and what that would mean for who we are. It's generally the trope to assume that if an alien force were to enslave the human race, they would do it like humans do slavery, meaning that in fact people remain people, only occupied and colonised in the way that a hell of a lot of people actually are right now. And that's an OK trope, but let's not pretend it isn't a metaphor for the past and the present. But if we did lose our preeminent place in the world, wouldn't we cease to be who we are? Our identity as humans, and even our consciousness, is quite possibly more of a construct than we realise, and to be part of a world ruled by life of a different order might change us. 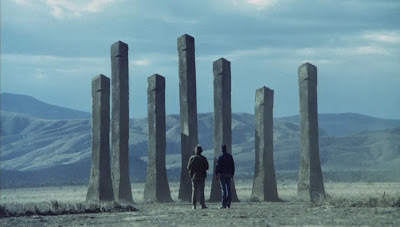 With the anthropocene extinction in film swing, a film like Phase IV (like Annihilation) suddenly seems, if not exactly prescient, a warning of how we might be on the way to the extinction of everything that we are. This reminds me of War Against the Chtorr, which among all the large scale monsters and other horrors has these bands of humans that have lost language and been essentially integrated into the alien environment overwriting earth's.